Sherlock Holmes & Sherlock Holmes: A Game Of Shadows Just $8 Down From $20! You are here: Home / Great Deals / Amazon Deals / Sherlock Holmes & Sherlock Holmes: A Game Of Shadows [Blu-ray] Just $8 Down From $20! 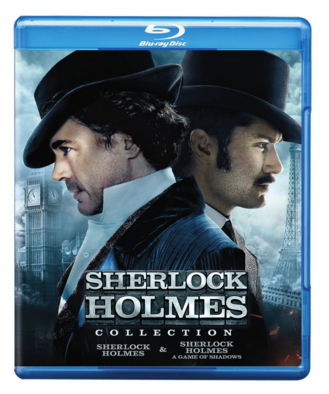 Sherlock Holmes & Sherlock Holmes: A Game Of Shadows [Blu-ray] Just $8 Down From $20! Here’s a great Amazon deal on Sherlock Holmes & Sherlock Holmes: A Game Of Shadows [Blu-ray] for just $8 down from $20! Get yours now while it lasts! When Austria’s crown prince is found dead, evidence seems to point to suicide. However, detective Sherlock Holmes (Robert Downey Jr.) deduces that the prince was murdered and that the crime is but a piece of a puzzle designed by an evil genius named Moriarty (Jared Harris). Holmes and his friend Dr. Watson (Jude Law), who are accompanied by a Gypsy (Noomi Rapace) whose life Holmes saved, chase Moriarty across Europe in the hope that they can thwart his plot before it can come to fruition.